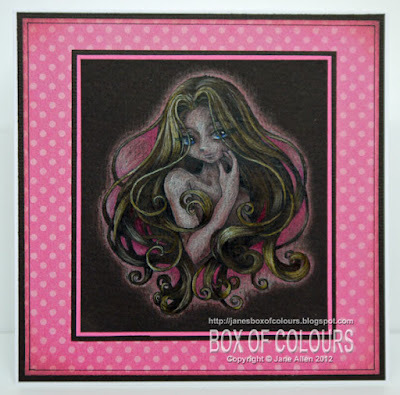 Jane's Box of Colours: What's chocolate and pink with a touch of ink? Well it could be me eating a strawberry creme from the box of Quality Street in my studio as I am always wearing ink!! I thought I would try my hand at colouring on an uber dark cardstock, chocolate brown to be precise, but I could not resist adding a shot or two of pink. If you colour on Kraft cardstock you will have noticed that the colours do tend to stand out more than when using a paler background. Now with this chocolate I found that the darker pencil colours blended into the background whereas the pale colours really jump out at you! A word of warning, although I could see the black printed lines to a degree, it is a challenge and it is best to have a clear printed version to hand to save your sanity when you get to a tricky area. Try it and see what you think ........are any of you brave enough to go dark? WOW WOW WOW , absolutely amazing!!! This is really so stunning, girl, you've got serious talent!! WOW this is wonderful! so dramatic and beautifully coloured! love it. Wow, Jane, this is gorgeous! The pink is perfect. Simply Beautiful. I can't say I've seen anything like this before. Thanks for sharing. Funny you should ask GF! I have just been coloring a pile of sheep on a dark charcoal paper. I keep putting it down cos like you say, while the colors look great on it, it does your eyes in trying to see the lines. I love how this came out and I think the punch of hot pink really adds the wow factor! WOWWWWWWEEEEE! Jane, this is FABULOUS! And scary ....don't know if I'm ready to go dark! Hehehehe! Love the pink of the background. Wow Jane, fabulous work. I'm not brave enough to try something so bold!!! Oh my - that is simply STUNNING Jane! Just love the highlights and your amazing touches of pink! I am definitely not as brave as you, lol! What an amazing look though - incredible!